7.1 surround sound is the common name for eight channel surround audio systems. It adds two additional speakers to the more conventional six channel (5.1) audio configuration. 7.1 surround sound positional audio uses the standard front, center, and LFE (bass) speaker configuration. 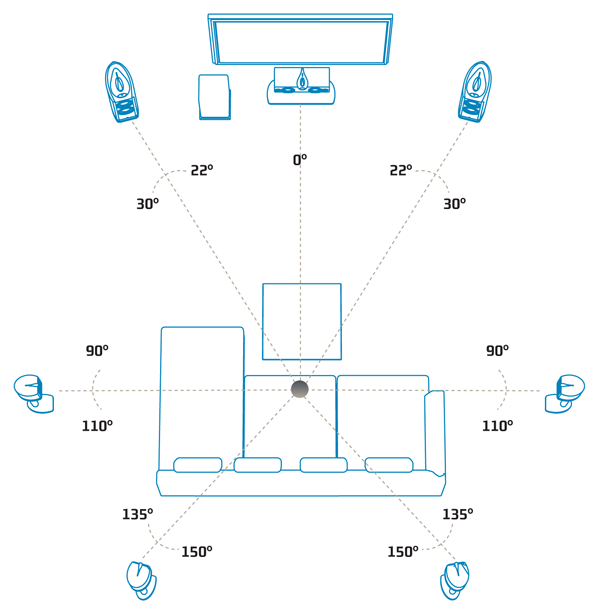 In its most common configuration, 7.1 surround sound includes two speakers positioned to the side and two to the rear. However, with the advent of Dolby Pro Logic IIz and DTS Neo:X, 7.1 surround sound can also refer to 5.1 surround sound configurations with the addition of two front height channels positioned above the front channels or two front wide channels positioned between the front and surround channels. The Blu-ray Disc and the HD DVD home video formats provide up to 8 channels of lossless DTS-HD Master Audio, Dolby TrueHD or uncompressed LPCM audio at 96 or 48 kHz/24 or 16-bit. The Sony PlayStation 3 video-game console can output up to 7.1 LPCM through HDMI for both Blu-ray movies and games. While some films have been remixed to 7.1 audio tracks on Blu-ray Discs for home cinema, the first discrete theatrical 7.1 soundtrack was Toy Story 3, followed by Step Up 3D. Disney announced that they will use 7.1 surround for their future 3D releases. Recent titles include Megamind, Tangled, Tron: Legacy, Gnomeo and Juliet, Mars Needs Moms, Gulliver's Travels, The Chronicles of Narnia: The Voyage of the Dawn Treader. 2011 is expected to release more movies with theatrical 7.1 audio, with titles like Thor, Pirates of the Caribbean: On Stranger Tides, Kung Fu Panda 2, Super 8, Green Lantern, Cars 2, Transformers: Dark of the Moon, Captain America: The First Avenger. All these titles are exhibited in the Dolby Surround 7.1 theatrical format. The history of electronic music includes the evolution of multi-channel playback in concert (arguably the real roots of 'surround sound' for cinema) and for a considerable time the 8-channel format was a de facto standard. This standardisation was fostered, in great measure, by the development of professional and semi-professional 8-track tape recorders - originally analog, but later manifesting in proprietary cassette formats by Alesis and Tascam. The speaker configuration, however, is much less traditional, and unlike cinematic reproduction systems, there is no hard-and-fast 'standard'. In fact, composers took (and to some extent still take) considerable interest in experimenting with speaker layouts. In these experiments, the goal is not limited to creating 'realistic' playback of believably natural sonic environments. Rather, the goals are often simply to experience and understand the effect created by variations on source and imaging.